B&O Play announces new H9 wireless headphones | What Hi-Fi? These over-ear cans offer wireless functionality and noise-cancellation with a 14-hour battery. They are available in black or Argilla grey and hit the shelves just in time for Christmas. 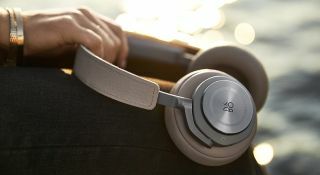 B&O Play has announced a new pair of wireless, over-ear headphones, the Beoplay H9s. These headphones’ focus seems to be their noise-cancelling functionality. The lambskin-covered earpads act as an isolating element for high-pitched sounds, while the active noise cancellation will, it is claimed, last for up to 14 hours from a three-hour charge. On the right earcup, a playback interface allows you to activate the noise-cancelling function, change songs, answer calls and control the volume. You can listen to music wirelessly, or attach a 3.5mm-jack cable for passive listening. The H9s also have "intelligent battery-saving" that will automatically turn off the headphones after 15 minutes, providing they are in Bluetooth mode and have not received signals from a smart device. The Beoplay H9 launches in two colours, black and Argilla (clay) grey. The headphones are available for £450 from the beginning of December this year.